Whether you’re searching for a rainy-day refuge or hours of outdoor play, Bellevue's multicultural Crossroads neighborhood is the ideal destination. A key anchor of the neighborhood is Crossroads Bellevue, a community-focused mall and public space. 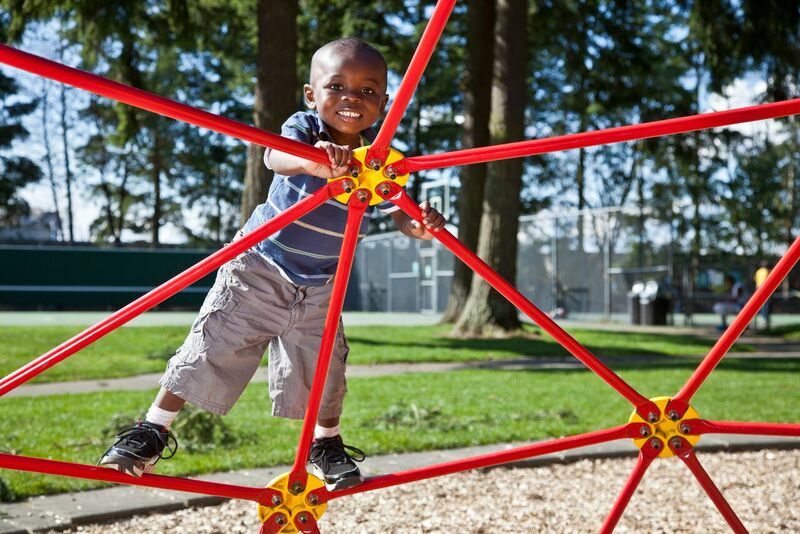 Just steps away, Crossroads Park is home to playgrounds, a theater, a seasonal splash park and even golf. But be sure to leave your preconceptions of the 'burbs behind: This corner of Bellevue is among the city's most diverse neighborhoods (and the city as a whole is more diverse than Seattle, by the way). Crossroads Bellevue wasn’t always such a vibrant hub. The mall went up in 1962 but, by the early 1980s, it was plagued with vacant stores and gang activity. That changed in 1988 when developer Ron Sher bought the mall with the goal of recasting it as a public space where diversity and community would thrive. Find out how well this vision succeeded by heading to Crossroads with your kids for a day's worth of adventures. Here are some of our favorites. If you have kids ages 4 and under, your first priority is probably burning energy. On a rainy day, head straight to WiggleWorks Kids at the center of the south wing of Crossroads Bellevue, where you might feel you've landed on the set of Willy Wonka. 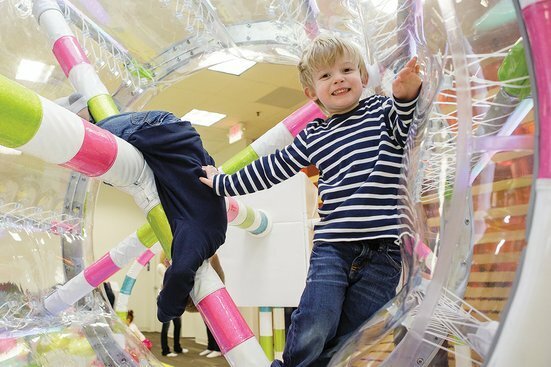 WiggleWorks is an indoor play space for kids 48 inches and under with moving, inflatable structures in all forms, including brightly colored balls that are blown into the air on the second story of a climbing structure. Admission is by the day so start here, pay once, and come back as often as you like. Pro tip: If you have older kids who can wander solo, send them to browse stores such as Old Navy, Uncle's Games, and Alter Ego Comics while the young ones bounce around. 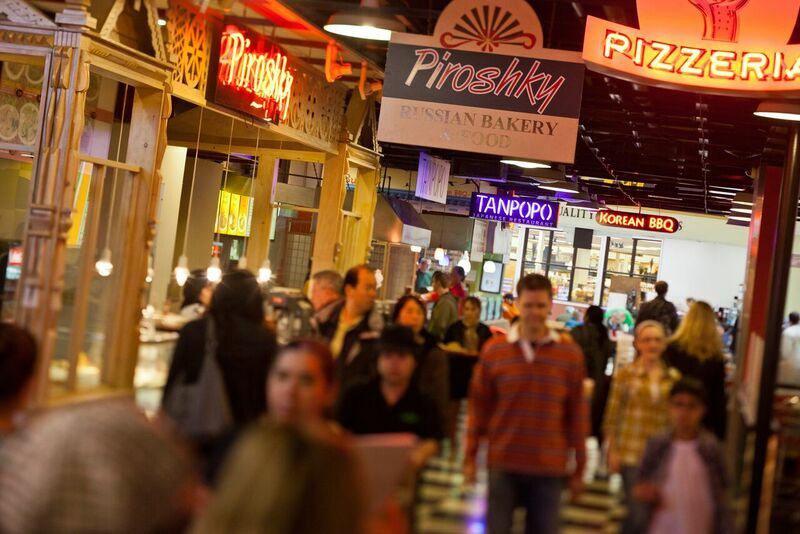 The Crossroads International Public Market (aka food court) in the center of the mall is like no other, with more than a dozen countries represented at the eateries. We especially love Papaya Vietnamese Cuisine, which serves a tofu lemongrass noodle salad that even young kids who “hate tofu” will devour. Piroshky, Piroshky serves a variety of savory, Russian-stuffed pastries that are easy for kids to hold, eat, and enjoy. There’s also pizza by the slice as well as Korean barbecue, Chinese stir-fry, Japanese sushi, Thai noodles, French croissants and much more. Pro tip: For dessert, make a stop at Candy Tyme, Crossroads' crazy candy store. 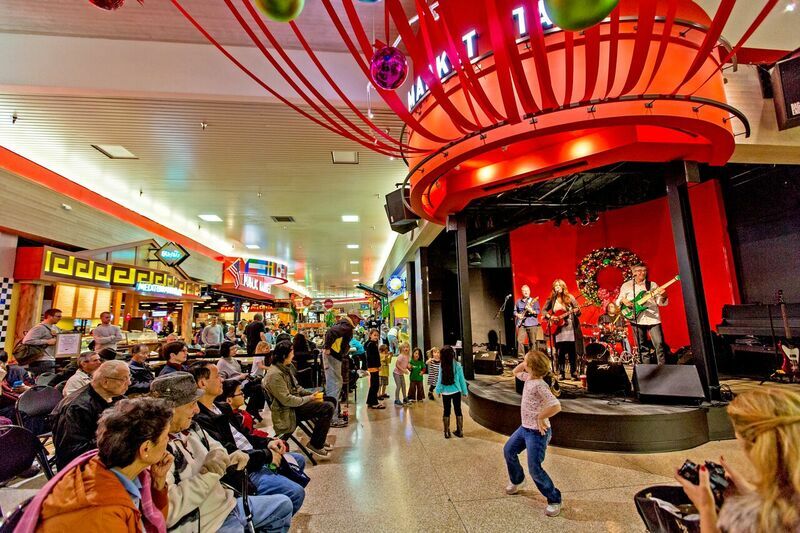 Many afternoons and most weekend evenings, there are live performances at Crossroads Bellevue's International MarketStage, located by the edge of the food court area. You can choose to sit close by and listen carefully or to dine further away and enjoy background music. 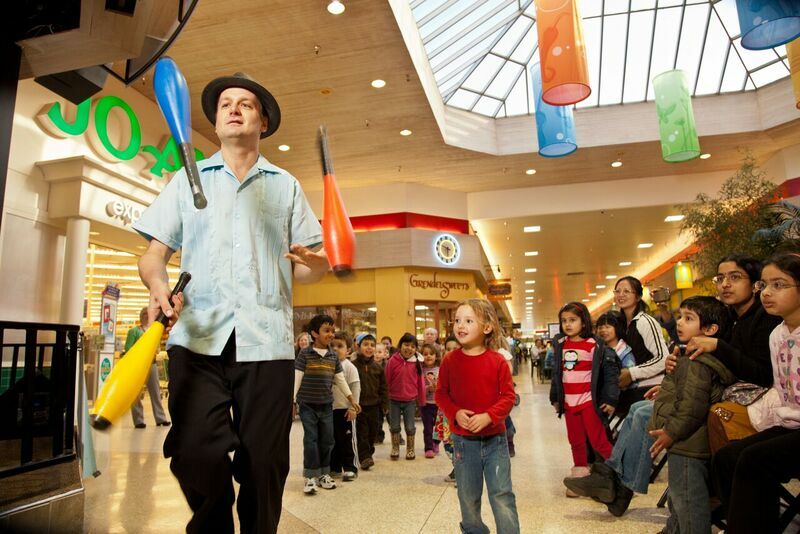 Every second Saturday, the mall hosts family time with a kid-friendly performance at 5:30 p.m., $1 popcorn for sale, family games at Uncle's Games, and a discount at WiggleWorks. Pro tip: The next Second Saturday show (Sept. 10) at the MarketStage features magician Alex Zerbe. After lunch, head over to Half Price Books (just across the hall from the food court). They have a fantastic kids' section and it’s pretty easy for kids of every age to get virtually lost whether they’re interested in picture books or chapter books. Creatively Yours, a paint-your-own ceramics studio is also within steps. Pick out an unpainted plate, mug or small sculpture and select paint colors, then get busy creating a keepsake. Maybe paint the feet of very young children and stamp their toes around a serving dish. And if you need to shop for school clothes or supplies, try shops such as Old Navy, Daiso Japan and Barnes and Noble. Pro tip: Need to get more wiggles out? Your older, active kids will also love to try climbing at Stone Gardens. If you have kids from 6 months to 5 years, don’t leave the mall without trying out a few of the vintage, coin-operated rides sprinkled throughout the mall, including classic ponies, a stunning, restored wooden yacht ready for small captains or (near the southeast exit) a train that goes back and forth on a small set of tracks. Most rides are just a quarter. Pro tip: There is also a small carousel near the food court that accommodates several kids at once for a bit of parent-and-toddler social time. If your kids are ready for outdoor play, head outside east of the mall to Crossroads Park, where at the far end of the park you'll find a climbable, spouting whale in a shallow pool of bright blue water. In summer, the whale sprays water and kids can wade in ankle-deep water; check the website, as it typically closes after Labor Day. There is also a fun, dry play structure beside the splash park, as well as public restrooms. Pro tip: If the kids brought bikes, they will also enjoy pedaling on the curvy, paved paths in the park that are just right for tricycles and training wheels. Don't leave the park yet! Heading west back toward the mall, you’ll find another large play structure with a long, twisty slide tucked in the shade of the tall Douglas fir trees as well as a par 3, 9-hole golf course that is perfect for young kids and families just learning the game. No tee times are required; there is a small practice area, a putting green, free clubs and a snack bar. You can also play footgolf. Pro tip: The course is open seasonally from March 31 through Oct. 31 and costs $9–$13 to play on weekdays, a bit more on weekends. On a hot day, stop by 4 Guys on 164th Street (at the east end of the park), where you'll find a milkshake vending machine! Pick a flavor from the f’real freezer, rip off the top, stick it in the machine, select your preferred milkshake thickness, push a button and whoosh. Your milkshake cup is sucked up into the machine and whirled into frothy goodness. Yum. Just south of the park, exploring a strip mall with a great collection of international convenience stores will be a fun finale. Browse La Superior for food and gifts from Mexico and a particularly great collection of soccer (a.k.a. football) jerseys and piñatas; next door, The European Grocery is packed with salami, cookies, frozen pelmeni and more. Pro tip: Just a few doors down, the Old Country bakery bakes and sells bread and pastries in the European tradition. Crossroads Farmers Market: On Tuesdays from noon–6 p.m. head to the east parking lot of Crossroads Bellevue to find a wonderful farmers market. In addition to berries, tomatoes and beans, discover flowers, pet treats, jewelry and ready-to-eat delicacies. There’s also live music and a rotating selection of food trucks including Kiss My Grits and Toyko Dog. The market runs from June through Sept. 27 this year. Showtime: Bellevue Youth Theater is located just behind Crossroads mall. It hosts community theater performances on many weekends. Check showtimes and buy tickets through the City of Bellevue website. There is also newly remodeled Regal Cinema with “royal king-size recliners” just beside the mall. Mini City Hall and King County Library: Inside Crossroads mall, you can get information and pay city bills at the mini city hall. They have multilingual service hours every week in eight different languages. Check the website for the schedule. You can also visit a small branch of the King County Library System. There aren’t many books but there are several community-access computers. If you request books on line, you can have them delivered to this convenient branch. Community chess: There is a giant chess board on the floor at the north end of the Crossroads Bellevue mall. Weekday hours start at 4 p.m. and weekend hours start at 11 a.m. It’s fun to watch players from all over the world focus on strategy and move the giant pieces. Getting there: Crossroads Bellevue is located at 15600 N.E. Eighth St., Bellevue. The main entrance to Crossroads Mall is on 156th St. It can be reached by King County Metro bus routes 221, 226, and 245. Hours: Crossroads' Bellevue retail stores are open Monday–Saturday, 10 a.m.–9 p.m.; Sunday, 11 a.m.–6 p.m.
Events: Find the full events schedule for Crossroads Bellevue on the website (cool fact: the website can be translated into more than 100 languages). And find more day trips to Kirkland, Redmond, Gig Harbor, Bellingham, Enumclaw in this article.